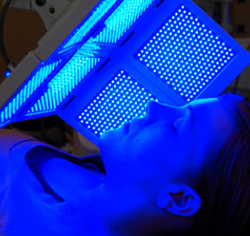 Blue light (wavelength 405nm-420nm) is mainly absorbed by the epidermis of the skin. This slight, blue-light penetration targets P. acnes (Propionibacterium acnes) by triggering porphyrins (a group of disorders that can cause nerve or skin problems) to produce intracellular singlet oxygen to prompt bacterial cessation. Red light (wavelength 630nm-640nm) Red light energy has a critical outcome on mitochondrial stimulation. This energy boosts the production of ATP (a skin-restoring ingredient and soothing agent) and also increases fibroblast action. The Red Light passes through human tissue with 80% of the energy being absorbed in the first 2 centimeters of skin tissue. Improvements in anti-inflammatory emission, superficial circulation and cellular turnover are achieved. 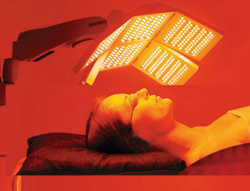 Infrared (IR) light (wavelength 800nm – 900nm) Infrared energy is acknowledged to heat tissue resulting in therapeutic pain reduction and management. A NASA study has shown that because Infrared light energy passes more deeply through tissue than Red or Blue light, cell membrane permeability is increased. Regarding cosmetic purposes, IR assists in the process of cellular pH equilibrium, while increasing nutritional absorption and elimination of waste byproducts. Elastin fibers and collagen bundles are boosted when Infrared and Red energy are employed together. 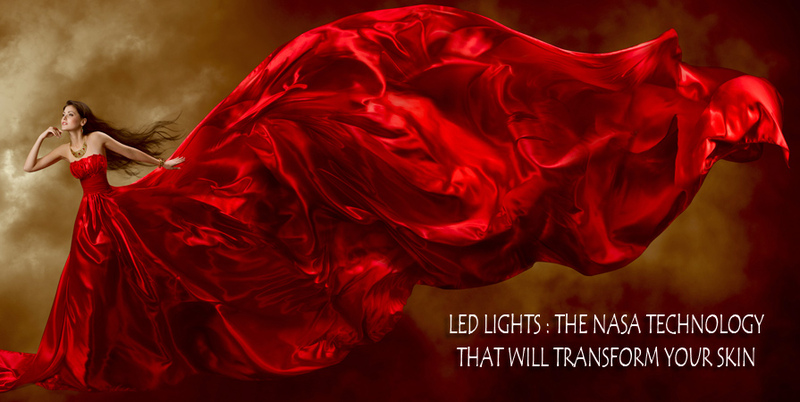 The Best Part of LED Skin Treatments! Anti-Aging – LED LIGHTWAVE's™ proprietary (Red and/or IR Light) LED light Therapy is constructed to reduce fine lines and wrinkles, to increase collagen and elastin formation while re-hydrating your face. It will also restore skin tone, decrease flaccidity, lift sagging tissues and reinstate texture to help erase years from one's appearance. We recommend 10 sessions with once-monthly (or as needed) maintenance appointments to extend youthful appearance. Scars – LED LIGHTWAVE's™ proprietary (Red and/or IR Light) LED light Therapy activates the shrinkage of fibrotic tissue and the replacement for normal and healthy tissue. After a session, you will usually observe a flattening, widening and softening of the scar, which is a commonplace progression in scar reduction. With subsequent treatments, the wide and flat scar will become more narrow and stay flat. However, some lasting (hypertrophic and/or keloid) skin marks may be unreceptive to this regimen. A made-to-order LED LIGHTWAVE™ protocol and/or supplementary treatment choices may need to be employed. Pigmentation – LED LIGHTWAVE's™ proprietary (Red and/or IR Light) LED light Therapy reduces chemical build-up and reactions from chemical peels and helps to correct sun-damage discoloration and excessive use of skin damaging products by normalizing the melanin within your skin. Depending on the measure of skin damage, skin thickness and age of client, the number of treatments may vary. Combination therapy of topical ointments such as hydroquinone and/or IPL and/or laser may be required for more serious conditions - followed by LED LIGHTWAVE™ Therapy. 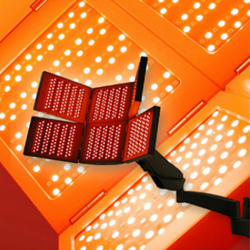 Flaccid Skin – LED LIGHTWAVE's™ proprietary (Red and/or IR Light) LED light Therapy is especially effective over the neck, upper chest and abdomen areas. This treatment delivers nutrition to compromised tissue and focuses on skin retraction by increasing circulation. Twice-weekly treatments should be administered and may necessitate between 10 and 15 treatments. Preventative Care - LED LIGHTWAVE™ helps to normalize dry or oily skin, producing a complete improvement in skin texture and tone. Your circulation will increase to deliver nutrients to the surface of your skin. This will also keep your skin from breaking down. Discomfort - LED LIGHTWAVE™ therapy is also used within 72 hours of any traumatic circumstance including post-surgical interventions to minimize scarring and promote normal tissue formation. LED LIGHTWAVE™ therapy can also target inflammation related with trauma or an allergic reaction that causes irritation and/or pain with a focus on clients who experience unrelenting muscle and joint discomfort. Mild to Moderate Acne (Blue/Red Combo) – At the outset for this acne treatment, the client is exposed to 15 minutes of Blue light that first enters the sebaceous glands to create Singlet Oxygen. 15 minutes of Singlet oxygen then in turn kills the bacteria. 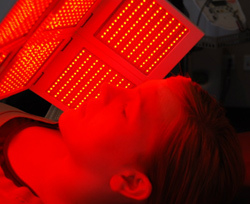 Next, the client is exposed to 15 minutes of red light which aids in the healing process of the skin and prevents infection and scarring from occurring. LED LIGHTWAVE™ is constructed to improve impaired skin and to decidedly reduce the bacteria responsible for causing inflammatory acne vulgaris. allowing the various treatment options. products American made under the strictest standards & guidelines. Individual results vary and cannot be guaranteed.